The popularity of the practical 1940's detachable dress collar continued into the early 1950's as women discovered an economical and beautiful way to extend their wardrobe. 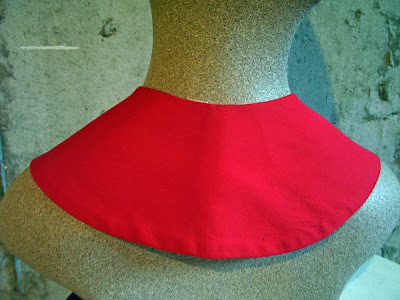 This is a gorgeous red cotton detachable dress collar, made in England for Olgilvy's of Montreal. It changes the look of a dress or blouse entirely and can be turned to have a peaked collar look at the front.